NRI returnees has multiplied exponentially. SAN FRANCISCO: In India, where ‘Moving to the USA’ is the ultimate nirvana of the smart and successful, it seems ludicrous to suggest that the tide is reversing. But in America, the number of educated immigrants relocating to their homeland is significantly increasing, capturing the attention of economic scientists and think tanks. They have even coined a term for it; ‘Reverse Brain Drain’. Set in motion by the dotcom bubble burst, the tribe of NRI returnees has multiplied exponentially since the global meltdown of 2008. Why are these skilled workers moving away from America? Professional, personal and cultural factors contribute to this issue. Entrepreneurship and business start-up is the primary goal for the majority of the returnees. India’s developing corporate structure promises better career prospects and job security. Another reckoning factor is immigration issues and visa regulations. The comfort zone of family, relatives and cultural identity is another big factor. Better standard of amenities, like housing, healthcare and schools are also a major draw. Do the returnees find it tough to reacclimatize? Are they content with their choice? How has the country changed since they left it? Three couples who moved back to India, took the big step, for different reasons, spoke to The American Bazaar. Vaidehi (far right) accepting an award. For Vaidehi and Arun, the move back to India was not brought about due to Green Card hassles or family pressures. There were no compelling factors, says Vaidehi. “It was always our desire to move back and we never looked back on our decision,” she said. Having been part of the Silicon Valley tech culture for more than a decade, the couple moved back to Bangalore in 2002. The logistic challenges of moving a decade’s worth of life in boxes notwithstanding, Vaidehi feels now they are at true peace. Their children, who are now in their teens, have settled well in India and have never complained about the move. Reminiscing about her life in the US, Vaidehi says she misses the library, travel, the peaceful drives, and the focus on quality customer service. She feels that her life in the US broadened her horizons. “I certainly became more open in my thoughts and learned to communicate to impact and I learned a lot about Early Childhood Education,” she said. Inspired by the professional teaching methods followed in the US, Vaidehi quit from the IT sector, and embarked on a teaching career. In 2003, the first Podar Jumbo Kids preschool was launched with the aim of providing a preschool program based on an International operating system, coupled with Indian ethos. Ten years and four branches later, Vaidehi’s commitment to excellence is evident through the success and recognition she has received. 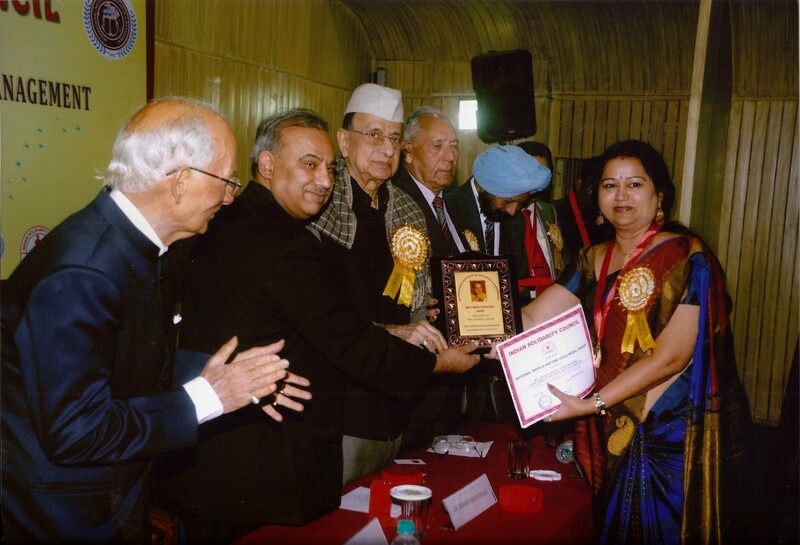 In 2013, she was awarded ‘The Rajiv Gandhi Vidya Gold Award’ for outstanding achievement in the field of education and ‘The National Mahila Rattan Gold Medal’ for Woman Entrepreneur. 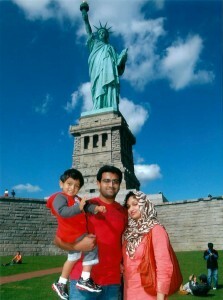 Vaidehi and her family go to the US often for vacations. The children have plans to come back for college, but the thought of migrating back to the US has never crossed their minds. Gulzar and Shamida with their son. Gulzar and Shamida, Thiruvananthapuram – “Had the best time of our lives’. Gulzar and Shamida describe their five year U.S stint as ‘the best time of their lives’. They lived the dream life of an NRI; had a baby, made good friends, with excellent quality of life. The move back to Thiruvananthapuram was prompted by Shamida’s hope to complete her bachelor’s degree in dental surgery. She had put the brakes on her course when they got married and moved to the US. Furthering her studies in the US was not a feasible option due to their visa status and the volatile job market. As Kerala was experiencing its first IT boom, Gulzar had no trouble clinching a lucrative job. “Everything moved into place and before we had a chance to change our mind, we were back in India,” he says. Given the home town advantage, Gulzar and Shamida knew what to expect, when they moved back. “Things have improved a lot even in a quiet town like Trivandrum. I remember my friends in US talking about the predicaments involved in doing simple things like paying the electricity bill (no longer the case as we can pay our bills online now). The infrastructure and bureaucracy leave a lot to be desired though,” says Shamida. “On the work front, I like my work a shade better here as I have a bigger team and my knowledge of the US software industry gives me an edge,” said Gulzar. And of course the icing on the cake is the being part of the big Indian family system. In US, various reasons compel one to stick with friends from the same community or other common factors but that is not really needed back home when one belong to a big family, the couple said. Farhan, their son, who was four when they relocated, was quick to adapt. The couple trusts that the Indian experience will help him to identify more with Indian culture, if they were to ever move back. Gulzar keeps shuttling to US as most of his clients are based there. The possibility of returning is still on the cards. Anjali and Ashif during their college days. Anjali and Ashif, Bangalore – ‘Adding value to life’. Anjali talked about her experience: “Within a few days of landing in the US in 2001 as a Ph.D. candidate in biophysics program, I met my (now) husband, Ashif, who was living in the same townhouse complex just off campus. I got my Ph.D. in 2007 and moved to Chicago to work as a post-doc at the University of Illinois. A few months later Ashif moved there, and we got married. In 2008, I landed a job as a scientist in a small biotech company in Ithaca, NY. We enjoyed our time there because of all the natural beauty and the plethora of outdoor activities. We had Dia in April 2009 at Ithaca. “Back home, my family was going through a testing time after my father was diagnosed with cancer in June 2009. After trying (unsuccessfully) to offer support over phone and email, I decided that I had to move back immediately to be with my family. “Finding a suitable job in India was perhaps the biggest trial. Although there are many opportunities, you have to brace for differences in corporate culture and work ethic. There is an overall inefficiency in getting things done. “We settled in Bangalore. Ashif is partner at a Chicago-based engineering consulting firm that provides structural design services on construction projects, while I work for the biotech firm Biocon. “Work is demanding and rewarding as the industry is experiencing a boom thanks to the growth in generic drugs. “Other things have taken a turn for the worse. Bangalore epitomizes India’s infrastructure nightmare. The roads are horrible and pollution is out of control. Corruption is widely endemic below the surface when it comes to government’s interactions with businesses. “Also, I miss the great friends I made, and the road trips we used to take. Although I don’t like to admit it, I sometimes miss the winters and the snow. The experiences that these couples shared though looks pretty nice to read, is unfortunately still painted with lot of grief and agony for their decision to move to India! else why would every single one expressed a wish to return back or send their kids to US back for studies! Why dont they just surrender their kids US citizenship and embrace Indian one! I can bet NOT a SINGLE of them will do. Reason is that even though people move out of US , it is not the love for motherland that brings them back, there are tons of other factors that force the decision which unfortunately no one shares with honesty. Visa is one of the most important deciding one(you suddenly get affectionate for India when your H1B status is questioned or 6 yrs limit is exceeded yet your EB2/EB3 is way backlogged! ). You start feeling for India when dollars falls, when you are laid off or when your H4 depended is unable to add to your bank account! India is and India willbe for ever a chaotic, anarchic, corrupted deteriorated country.. its hard to chance a human race that has gone so wild , untamed and uncontrolled. With a population of 1.2 billion plus, India is in fact vastly a urban disaster. That is why given any chance, every single kid in India will migrate to US, UK, Aus, NZ, Germany, Japan, Korea.. for studies (even these same people expressed that view for their kids). There are many more opportunities to do good for India by staying out of India than been in India.. else 90% of your life will be gone in traffic jams, railway queue, running behind the office babus and fighting for fare with auto and taxi. Rest 10% of that remains will be sucked by pollution and inflation.